'73 CB350G take II: resto-mod - The 3-4-5 Now it is a roller! Edit: added the name The 3-4-5 since the mains parts are coming from a Honda 350, 450 and 550. The main bike is a CB350. 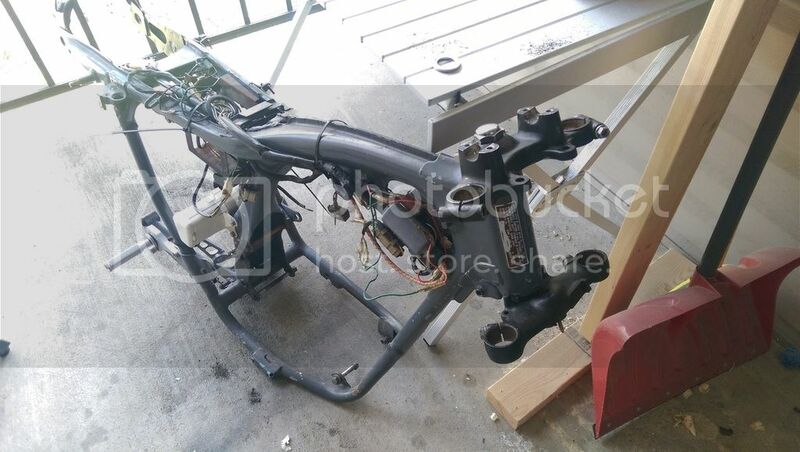 The front drum is CL450 and the front suspension is from a 550. So, I've been working on this bike and another project on and off for the past few years. The CB350 was to be a cafe style bike, and my other CB125 project was a fun little tracker. (build threads in my signature) I finished the tracker, enjoyed it for a few months and I've since sold it. Now, I don't want to go back to the half-assed cafe bike I was building out of the CB350. My new goal is to rebuild the bike with some period-correct upgrades and a few modern ones. I'm going to toss a CB550 front end on there with cartridge emulators. 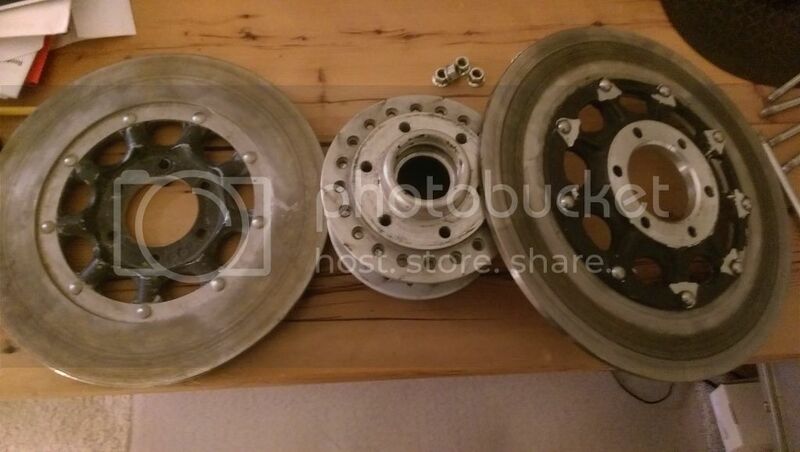 CB550 front hub with dual discs too and I'll be installing new aluminum rims on the hubs. Still have to figure out what to do for the rear suspension, maybe Hagons or something like that. While everything is apart I'm also going to toss new bearings/seals/whatever anywhere there is a consumable part. I'm considering the practicality of making the covers and fenders out of composite material, for a more custom look, but not too far from stock. For this year I plan on leaving the motor stock, though I am considering a winter rebuild with all new seals and everything. Maybe after a year or two of enjoying these upgrades I'll hop the motor up a bit. First things first though, I've got to finish the front-end rebuild. Dual discs! I've already got a caliper setup from another bike and will be salvaging the 2nd caliper from the exisiting CB350 front-end. 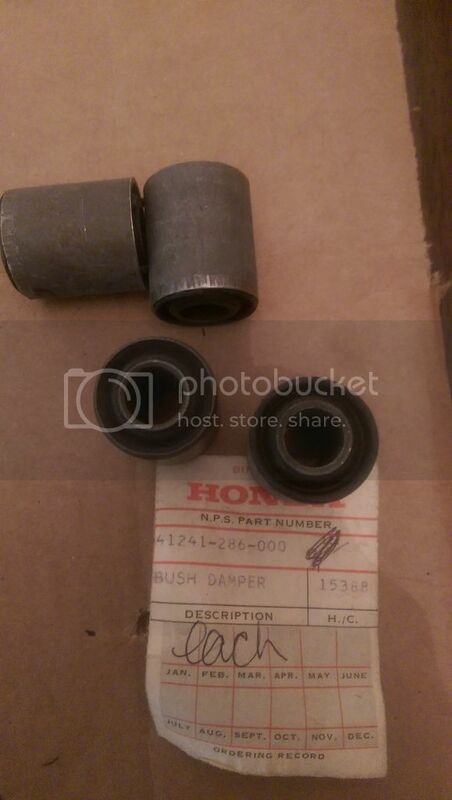 I've managed to get a set of OEM rear bushings for a reasonable price. With these I can finally finish the teardown of the hubs and have them powdercoated. Finally got the piston out of the second caliper. I tried a few things, but the grease gun trick ended up working. Now that I have all of the components sorted out I can get to actually get to mocking up the dual disc setup. 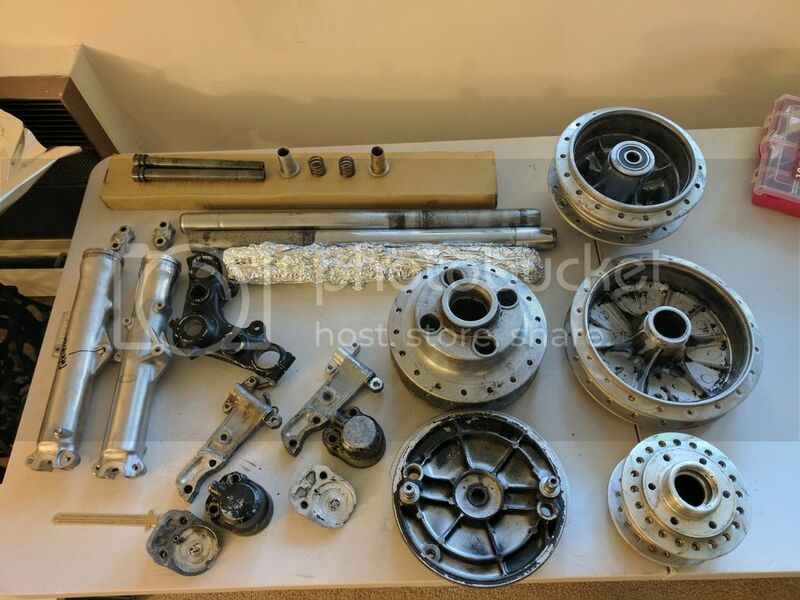 Dual discs for a CB350? Seems like overkill to me. Have to agree - unless you use light weight discs, you're pretty much just adding extra weight to your wheel without a real benefit. It is indeed overkill, but I'm alright with it. In fact there are a few other functional things that I want to add to this build that will likely be considered overkill. For far future plans I know there is an aftermarket set of discs that are 5mm thick instead of 7mm and someday i might swap out for them, or try to adapt a better caliper with lighter discs. But for now I'll stick with heavy 70's era tech. Slowly but surely making progress on the bike. Finally got the new All Balls tapered steering bearings installed, and the CB550 stem in(after some work with the angle grinder). 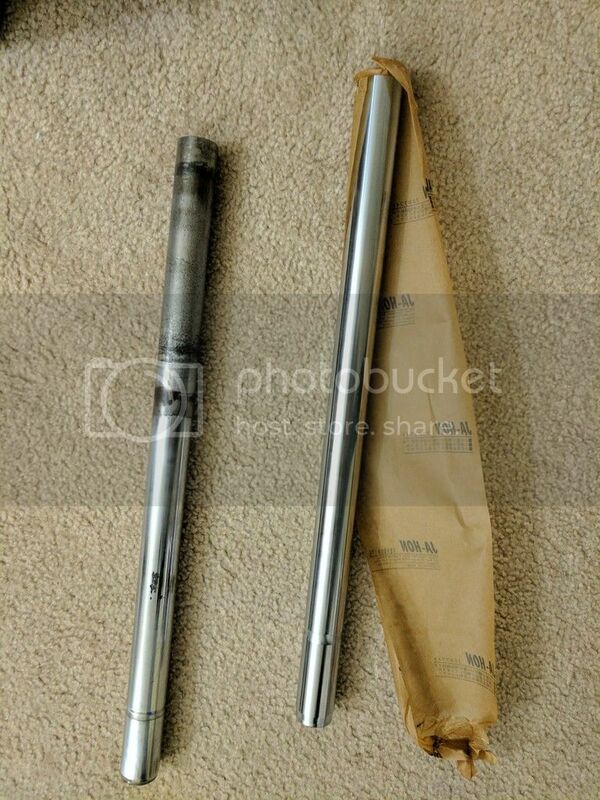 I'm now ready for the 35mm forks! Next step is getting some odds and ends powdercoated so I can put the forks and front hub back together. 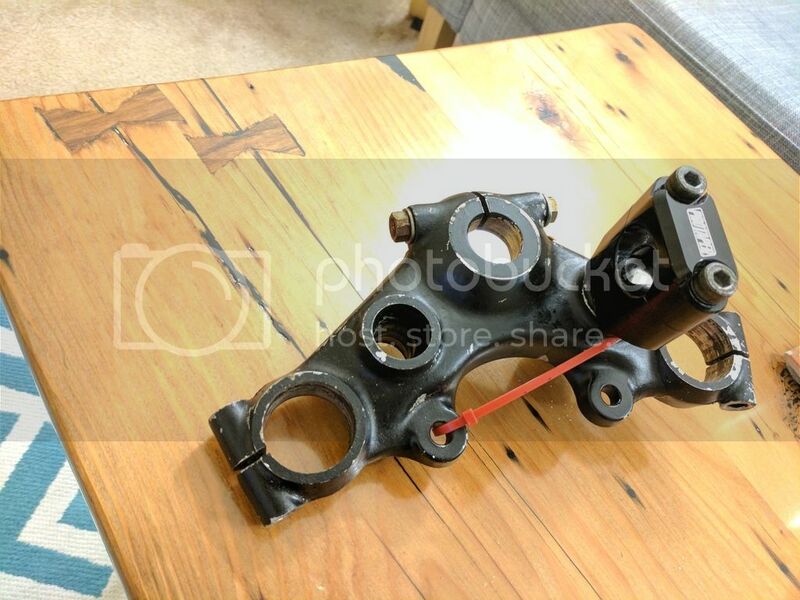 After lots of swearing and hammering I finally got the bushings out of the swingarm. 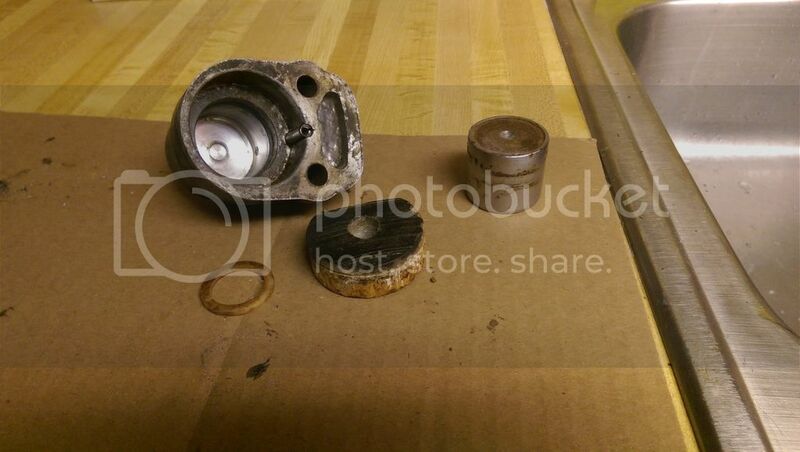 Also disassembled and pulled the bearings from the hubs. Getting ready for powdercoating. I plan on having a running, driving bike again by spring (hopefully). Some of the longer term plans will have to wait, but I plan on finishing the wheels/tires/suspension then buttoning it back up in otherwise stock form for spring. New fork tubes from cycleX for the 35mm front end. Also finally got to mount the 1 1/8 bar risers that I plan on using to the steering stem. Pretty excited to get the front end back together soon. Finally have all of the bits ready to go off to get powdercoated. I still can't decide between dual disc CB550 front end, or a drum CL450. So i think I'm just going to end up with both... I guess it'll be a gametime decision and I'll have a spare setup for a future project!